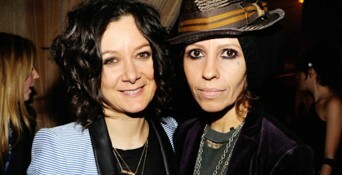 After a one-year engagement, the 4 Non-Blondes hitmaker Linda Perry, 48, made an honest woman of “Roseanne” and “The Talk” star Sara Gilbert, 39, in a romantic ceremony on Sunday, March 30. In addition to her hit “What’s Going On?,” Perry has penned hits for Pink, Christina Aguilera, Gwen Stefani and others. Perry and Gilbert started dating in 2011 after Gilbert’s split from TV producer Alison Adler with whom she shares two children, son, Levi, 9, and daughter, Sawyer, 6. The wedding took place at sunset overlooking the ocean. Celebrities in attendance included Juliette Lewis, Aisha Taylor and Julie Chen. The pair is enjoying a weeklong honeymoon. Posted March 31st, 2014 & filed under News.